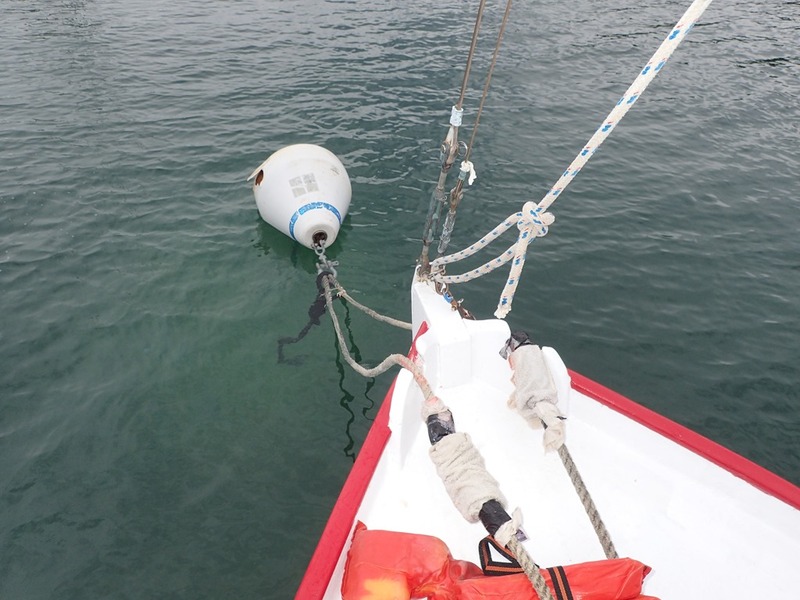 Yesterday morning’s net included a BOLO – “be on the lookout for.” A Westsail 32 was overdue. 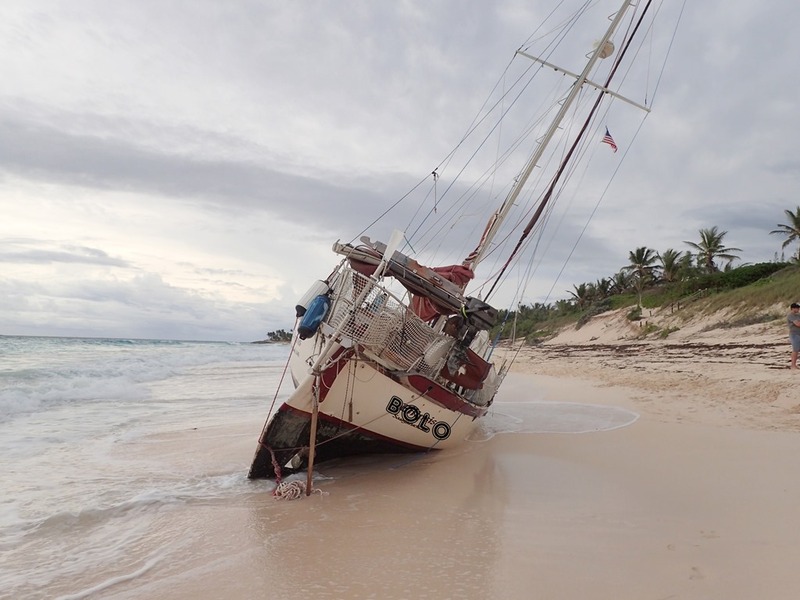 She’d sailed out of Puerto Rico on Dec. 26, bound for St. Augustine, with possible stops in the Turks and Caicos and Bahamas. We’d seen a US Coast Guard helicopter overhead the day before, skimming the shore on the ocean side. 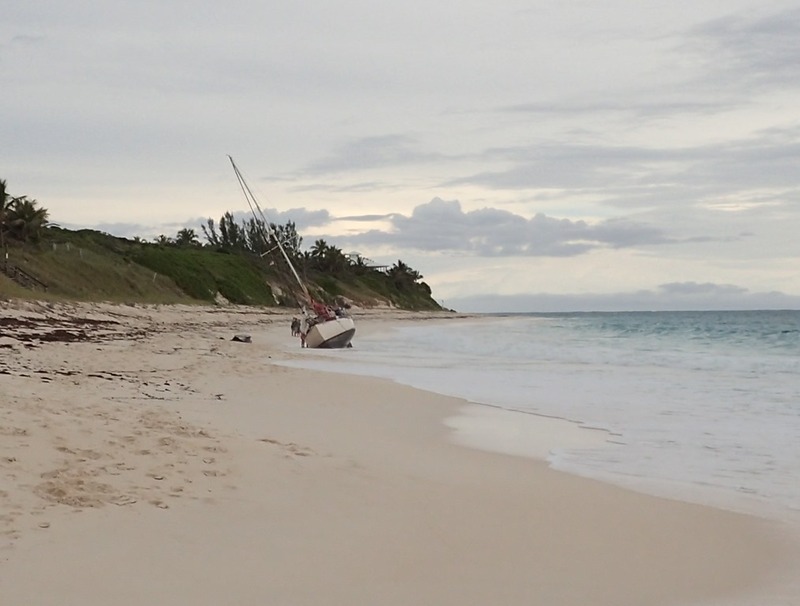 By this morning the boat had been found – washed up on the north beach of Elbow Cay. The two men and dog on board were safe, but the boat didn’t fare as well. 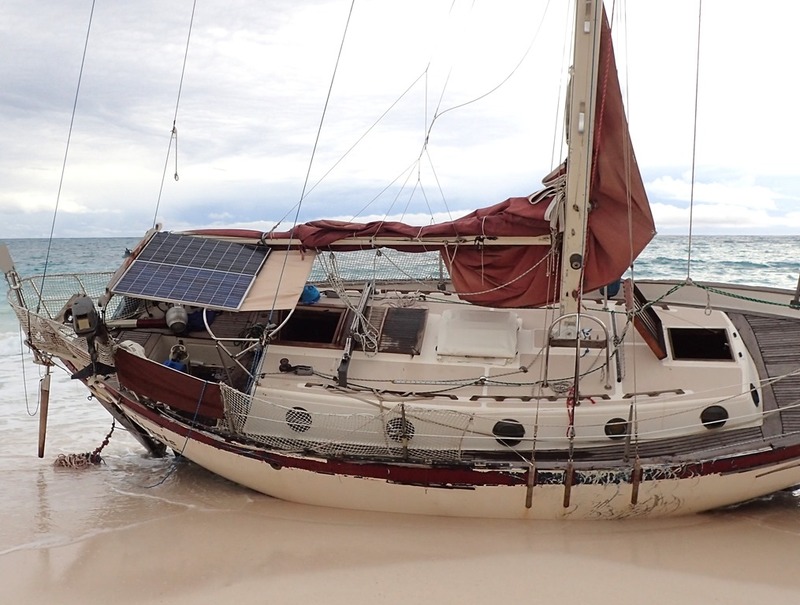 This is a good, solid boat, which is probably how it managed to stay together through the reef, but the banging it took on the beach left cracks in the hull. Not so bad that it sunk, but bad. The boat was well-outfitted and it’s crew well-seasoned. It’d survived Hurricane Maria in Puerto Rico and was headed home. 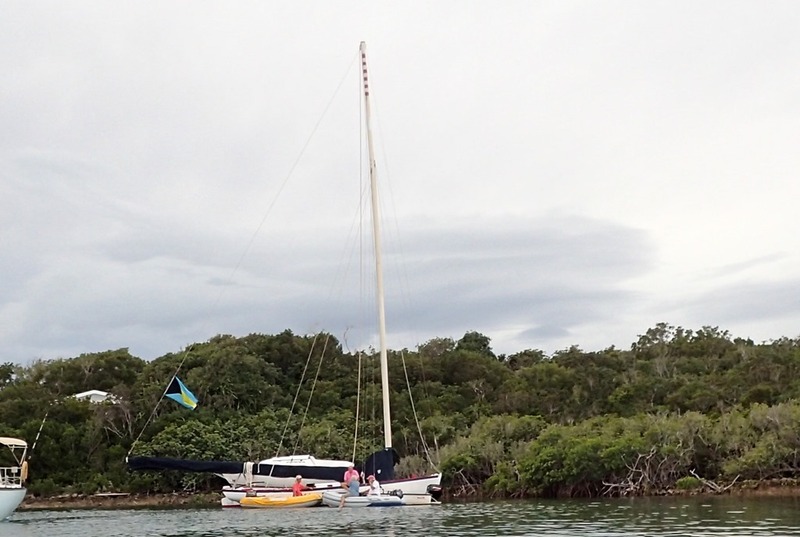 But by the time they reached Elbow Cay, the boat had lost power in the engine, causing it to lose all electronics – no GPS. The crew was exhausted. 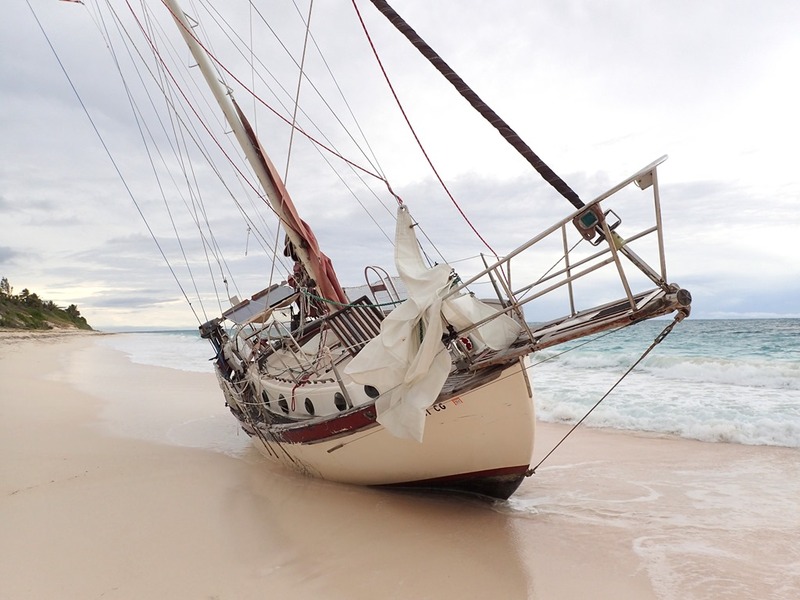 Somehow, the boat managed to get through Elbow Reef and find a sand beach, ( i.e, not rocks), to land on. The crew walked off the boat last night about 9pm and climbed up to the nearest cottage. Truly the stuff of nightmares for sailors. BUT the WestSail wasn’t the only boat that had had a bad night. 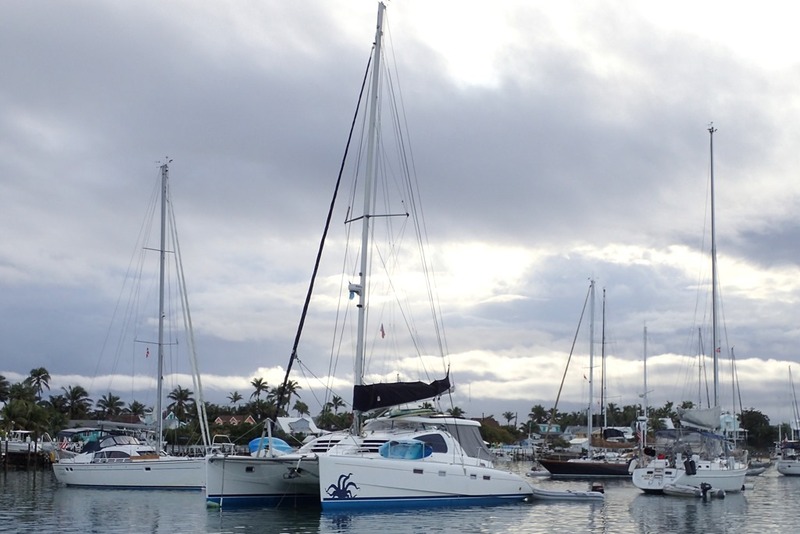 All of us in the harbor had rocked and rolled as strong squalls passed over; we had 4 inches of rain. It just BEAT on the hull overhead. 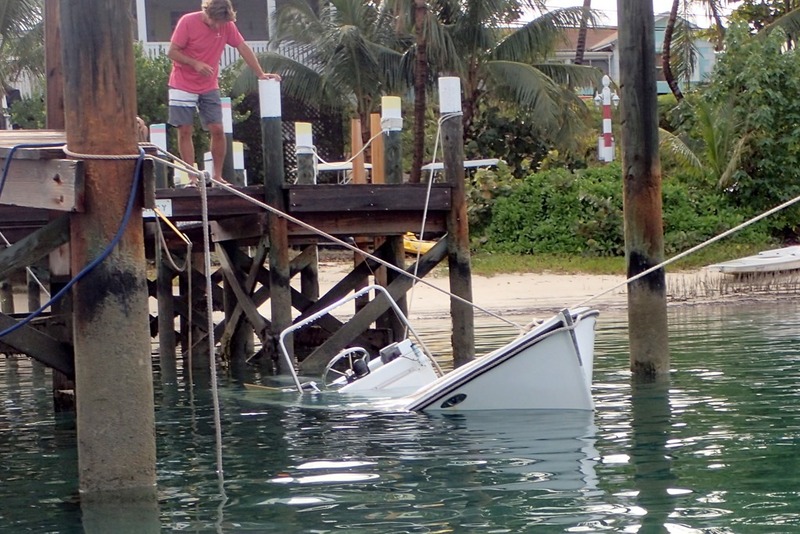 We were doing an early morning garbage run before heading to the beach to check out the BOLO boat when we saw a runabout that had sunk, still tied to a dock. 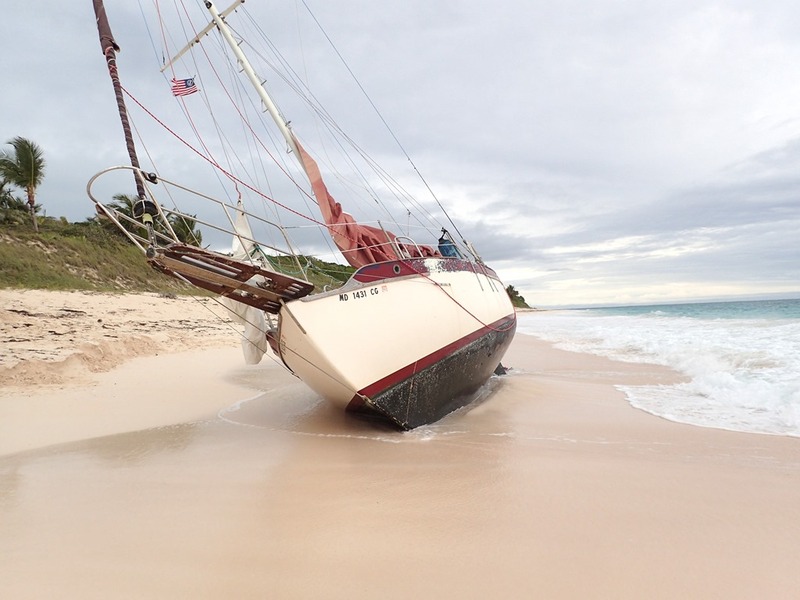 The boat’s automatic bilge pump had failed. We stopped to help. Lots of team work and muscle soon had her afloat again. 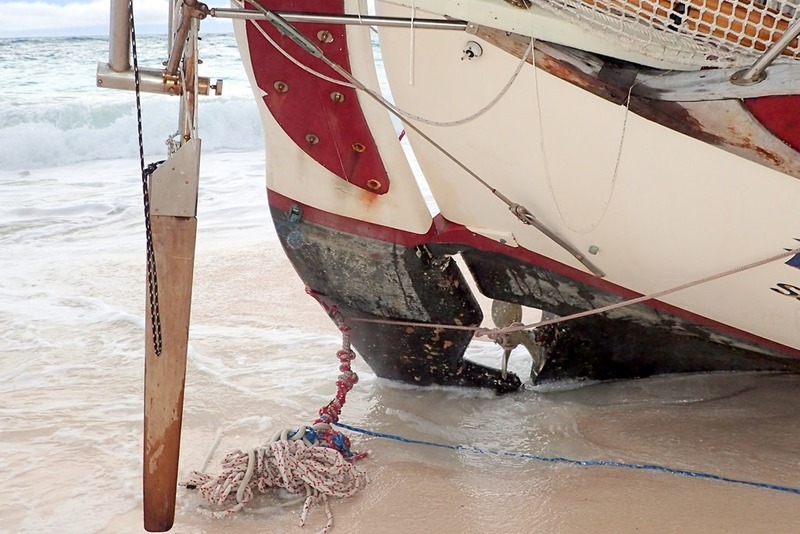 Then we discovered that the Abaco Rage, that beautiful traditional Class A Bahamian racing boat, had chafed through her mooring line last night and drifted to shore. 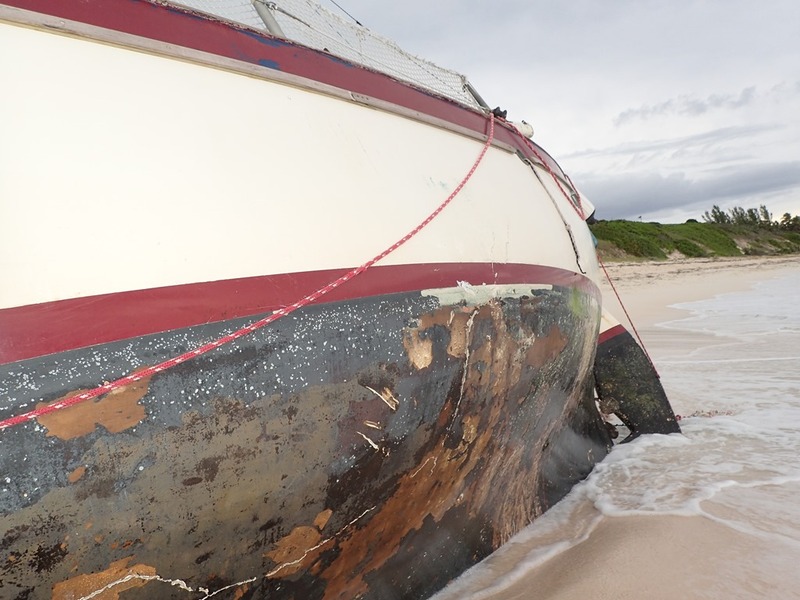 She managed not to hit any other boats and ran aground just short of the rocks. 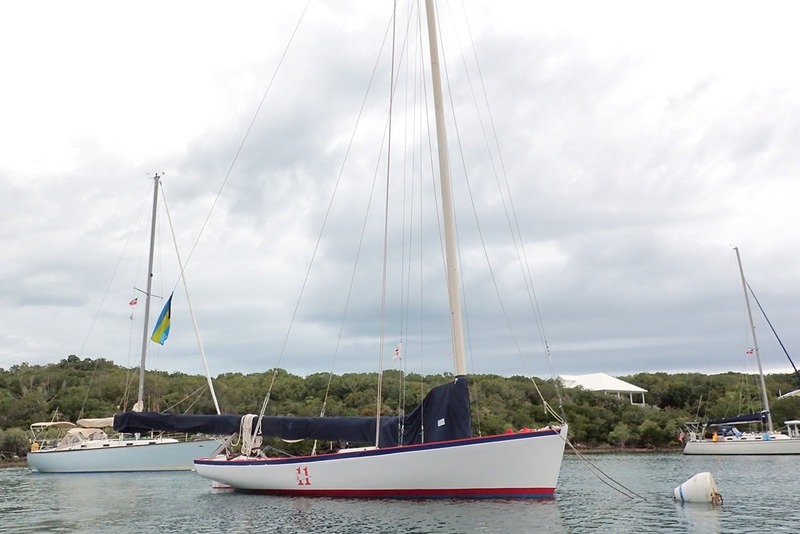 We stood on her bow as the tide rose and off she came, with a tow back to her mooring. All safe now, with new, stronger lines. And no damage to her beautifully painted freeboard. So the night had created some havoc. Which seemed so unlikely given the calmness of the early morning. So calm and still the boats couldn’t figure out where the wind was. They ended up all catawampus in the harbor, pointing forwards, backwards and sideways. P.S. 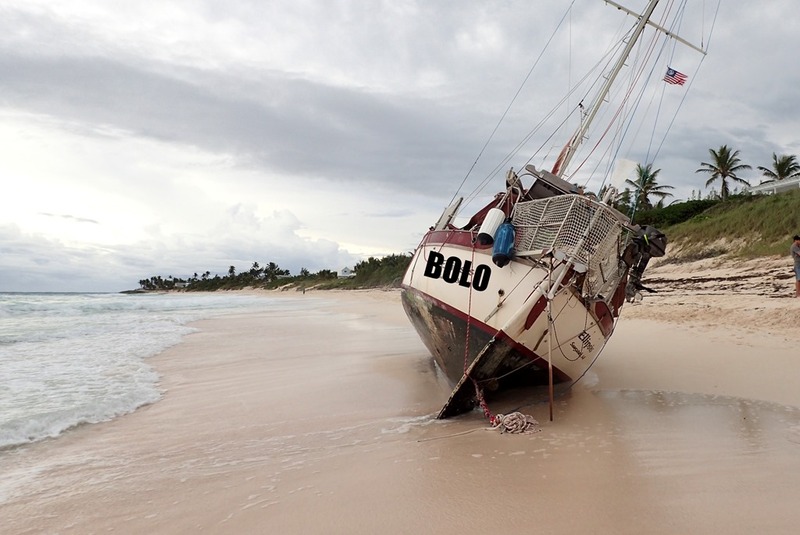 BOLO’s for overdue boats are not uncommon, but usually they end better – the crew diverting or not checking in – all happily drunk at Nipper’s or passed out in a bar in Key West. Great read, Nancy. How scary this all would have been. You missed your calling…you could be a story teller! Curious what “Net” the BOLO was published on? 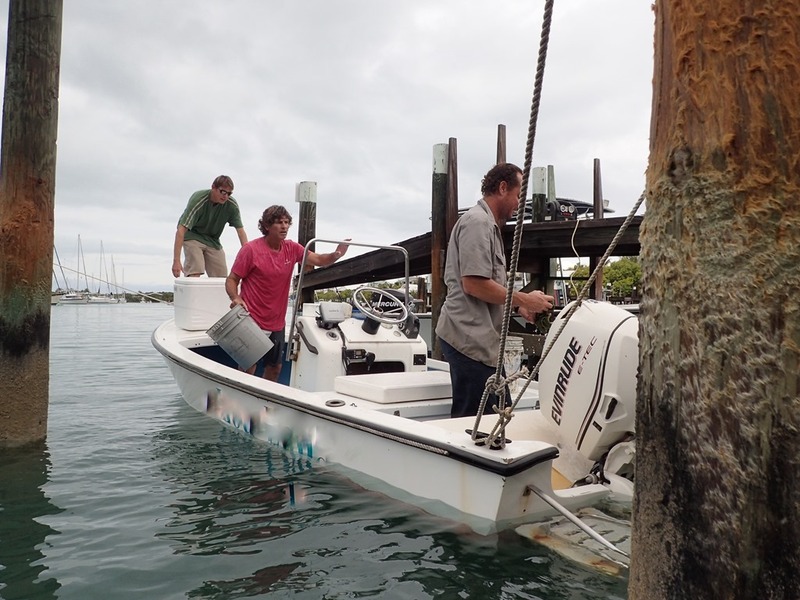 Volunteers in Hope Town (and Scotland cay) host a morning radio show on VHF 68 for all of Abaco — within receiving distance. Includes weather, community announcements, restaurant etc advertisements, and open mike. And BOLO’s.